Bandai Namco continues with more character reveals on their upcoming fighting game, Soul Calibur VI. Ever since it was given a release date, they haven’t let up on updates and new characters such as Talim couple of weeks ago. However, the most recent character reveal will make longtime fans scream with joy, as Bandai Namco has announced that the creepy, dancing, blade spinning, fetish wearing Voldo will be returning to the series. Curious for a closer look? Here are NEW screenshots featuring the return of Voldo to #SOULCALIBURVI! Will you be be maining this legendary character? Voldo’s insane and unpredictable fighting style makes a grand return, as does his unique outfit. Voldo is one of the series originals, debuting in the very first video game, Soul Blade, back in 1995. Right away players gravitated towards him, as his strange fighting moves and unique aesthetics made him stand out among the other fighters, even from other fighting games. Bandai Namco also gave us some backstory on Voldo, and it’s just as creepy as the man himself. Voldo was the right-hand man to Vercci, an arms dealer with the nickname ‘Merchant of Death,’ and was tasked to protect the Money Pit, where all of Vercci’s treasures were kept after his death. After spending years in the dark depths of the Money Pit, Voldo lost his eyesight but gained a heightened sense of hearing and awareness, making him extremely deadly to those who dared to enter the Money Pit in search of riches. Voldo’s fighting style is unmatched, as he contorts his body in unnatural ways and can even attack backwards, making him unpredictable and deadly in battle. 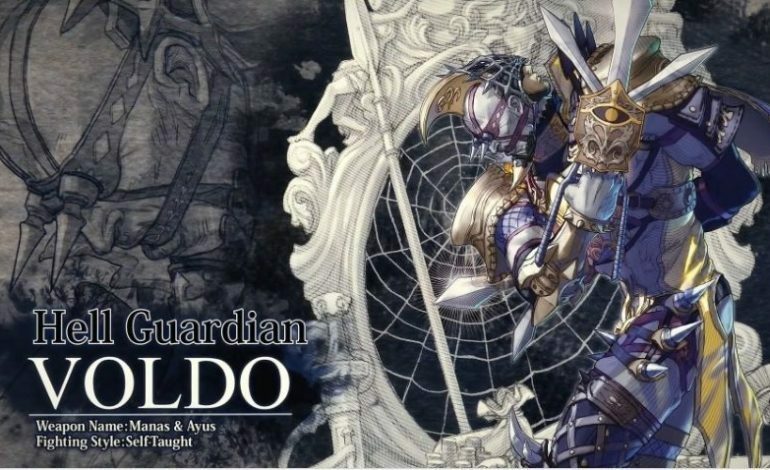 Voldo is just one of many characters announced for Soul Calibur VI, as the game will also include a guest fighter in Geralt of Rivia from The Witcher series. Even though the game’s release is only a few months away, it’s more than likely that Bandai Namco will continue to announce more characters to add to the ever growing roster. Soul Calibur VI launches on October 19 for the PlayStation 4, Xbox One, and PC.